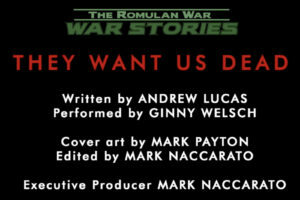 Fan Film Friday – THE ROMULAN WAR releases its newest enhanced audio drama: “THEY WANT US DEAD”! I’m beginning to really, really love these enhanced audio dramas that are being released by MARK NACCARATO as a lead-in to his highly anticipated THE ROMULAN WAR fan film! The project itself managed to take in over $12,000 in a recent Indiegogo (and is now trying to reach $14,000 to cover the cost of new live-action footage shot in Australia along with new CGI). And the full fan film itself is supposed to be released very soon. But in the meantime, Mark has released a series of “enhanced” audio dramas under the banner The Romulan War: “War Stories.” These are personal log entries from those serving in Starfleet during the Romulan War with Earth that led to the founding of the United Federation of Planets in the mid-22nd century. The idea is to tell the “smaller” stories of war, while the main fan film tells the “big” story. And what are “enhanced” audio dramas? Like most audio dramas, the actors record their lines vocally, without a video camera running. But rather than just playing back the audio over a black screen or a single image or even a series of images, there is actually an ongoing video the whole time, some with simple 2D animation, some with video footage, and some even with 3D CGI. Mark’s first release was made available to the public about a month ago, the two-part “Sleep Is Hard To Find” (you can view it here). Now the second release is a one-parter entitled “They Want Us Dead,” and it’s riveting. I really mean that. An intense and gripping vocal performance was turned in by actress GINNY WELSCH, who has extensive experience with voice work, over a brilliant script written by ANDREW J. LUCAS, who previously penned multiple episodes of the just-completed The Romulan Wars (plural) fan series. Just click here to donate. Mindcrime Entertainment has released a new audio drama in their “War Stories” series which ties in to their upcoming film, The Romulan War: A Star Trek Fan Production. The latest episode, “They Want Us Dead,” was written by Andrew J. Lucas and performed by Ginny Welsch. It tells the story of Sergeant Trisha Goddard as she and her MACO unit fight an ultimately futile battle against Romulan shock troops in the campaign to liberate Berengaria VII. Trisha’s account of events reveals the costs of war – both physically and psychologically. Canadian writer Andrew J. Lucas, author of “They Want Us Dead,” has written for role-playing games, science fiction anthologies, and he’s scripted multiple episodes of another Star Trek fan production. Bringing the story to life is voice actor Ginny Welsch, who plays the role of Sgt. Goddard from her home studio in Nashville, TN. Ginny has years of experience doing voice work in commercials, industrials, promotions – you name it! She’s also the co-founder and driving force behind WRFN – one of the country’s first licensed, low-powered FM radio stations. 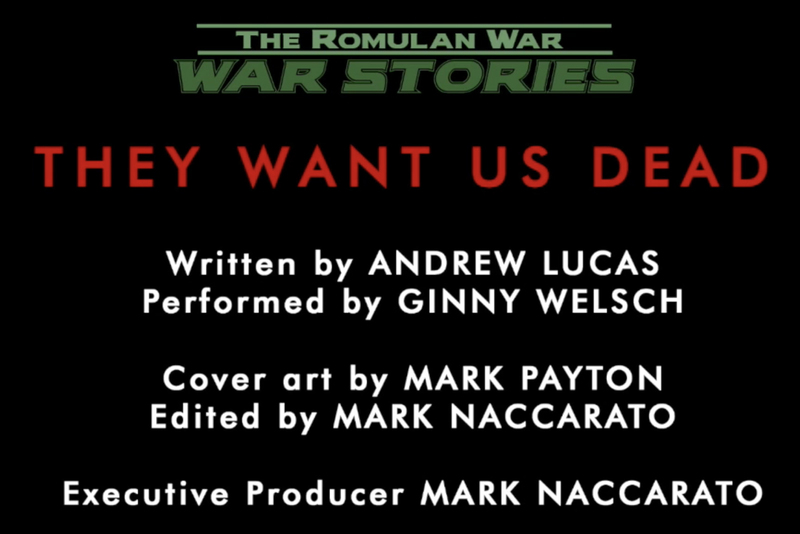 To listen to “They Want Us Dead,” stream it from The Romulan War’s Soundcloud page or take a look at the special “enhanced video” version of the story on The Romulan War’s YouTube channel. “They Want Us Dead” comes in the wake of Mindcrime’s two-part TRW audio drama, Sleep Is Hard to Find, which was released in August. More audio dramas tied into the TRW universe will be released over the next several months. Currently, The Romulan War: A Star Trek Fan Production is still raising funds to finance second-unit photography in Australia. For a limited time, backers will receive a limited-edition set of Lobby Cards from the film. For details and to donate, visit the production’s Indiegogo page.